There’s just too many Hearthstone cards to handle. New Hearthstone cards keep on coming. 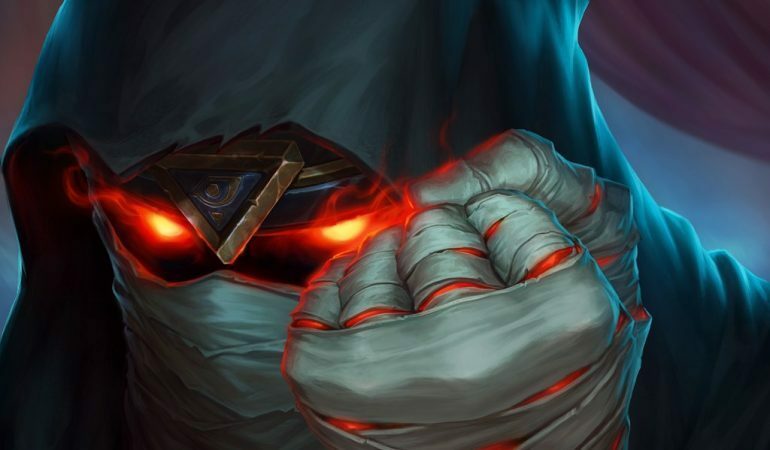 In preparation for the release of Rise of Shadows, four more cards have been revealed. There are two Druid cards—one that was officially revealed and one that’s leaked. There are new Rogue and Hunter cards, too. The Druid cards on the list aren’t particularly spectacular, but they’ll likely have some use. 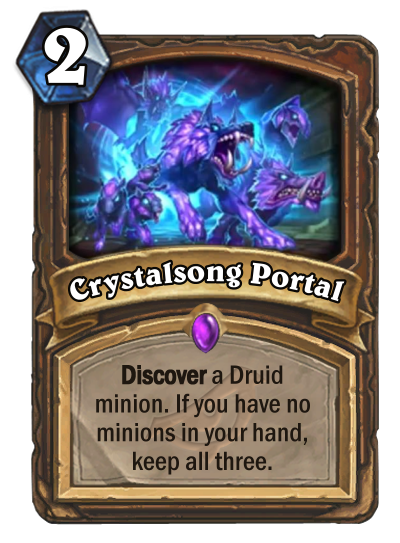 Crystalsong Portal is an Epic spell that costs two mana and discovers a Druid minion. If you have no minions in your hand, you keep all three. It’s a fairly decent card. It’s good support for Token Druid. Your cards are mostly spells, so you’re likely to get a fair amount of value out of it. You can easily control your hand and put your minions into play before you cast Crystalsong Portal and refill your hand. The next Druid card hasn’t been officially named yet. For the time being, though, Fluffy Squirrel Whisperer will suffice. 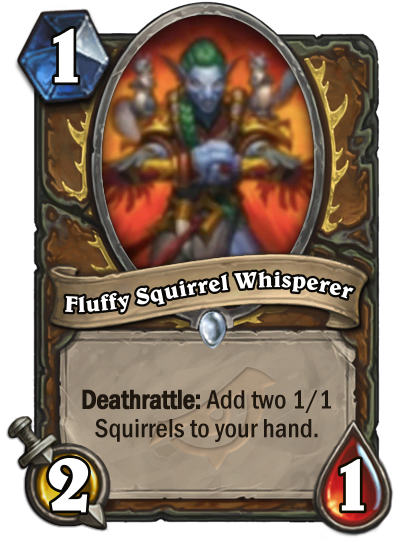 Fluffy Squirrel Whisperer is a one-mana Druid minion with two Attack and one Health. When the card dies, it activates its Deathrattle and puts two 1/1 Squirrels into your hand. The card fits well into aggro Druid decks. It can be used to take advantage of the early game and overwhelm your opponent. It could also possibly be used in Token Druid. If you play the card on your first turn, and your opponent activates its Deathrattle, you’ll have a decent second turn. If they ignore him, you can get in some free damage and take control of the board. The next card is Vendetta. It’s a four-mana Rogue spell that deals four damage to a minion. Furthermore, it costs zero mana if you’re holding a card from another class. You might think it looks niche and costs a fair amount, but it’s actually pretty good. It would work exceptionally well in a Burgle Rogue deck. 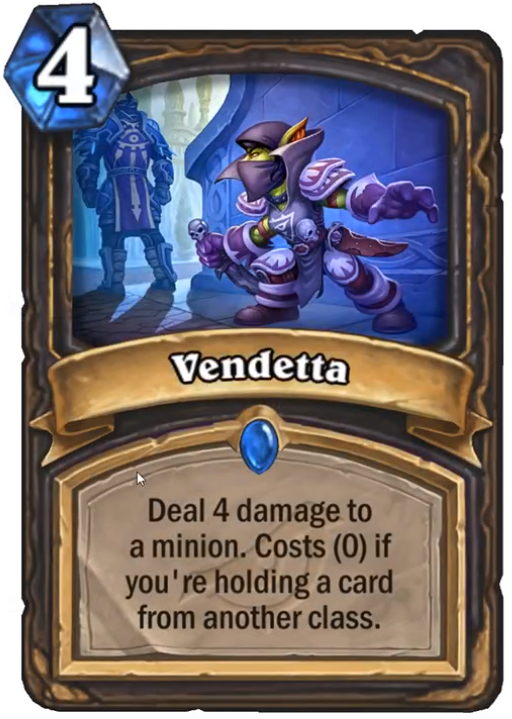 There’s a good chance you’re going to have a card from another class if you’re playing Burgle. This means Vendetta is essentially a zero-cost activator. If you’re facing off against another Rogue, it’s a different story, though. The final card is Nine Lives. As you may have easily guessed, it’s a Hunter card. It’s a three-mana spell that Discovers a Deathrattle minion that has already died in the game. It also triggers its Deathrattle. This card only works with Deathrattles and it’s particularly slow. It could synergize with the new Boommaster Flark Hunter legendary, but that’s a stretch. 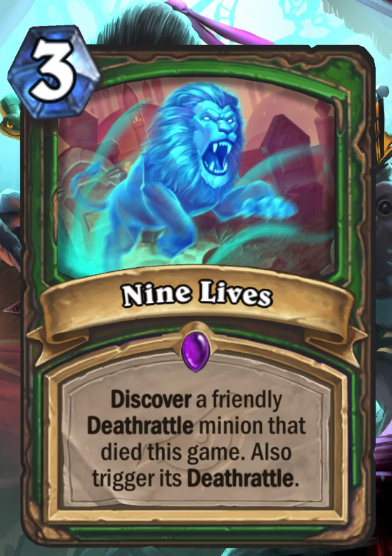 It’s likely there could be more Deathrattle-oriented cards on the way for Hunter, to allow Nine Lives to have some sort of value. You can have a closer look at all the new Hearthstone cards when Rise of Shadows is released on April 9.